It has been a busy time at the Flemington stables as we look forward to the summer and autumn carnivals with the likes of Alaskan Rose, Tulsa and Yesterday's Songs coming along nicely. Alaskan Rose and Yesterday's Songs pleased us with nice finishes at the jump-outs on Friday morning and are both set to resume at the Flemington meeting on January 30. 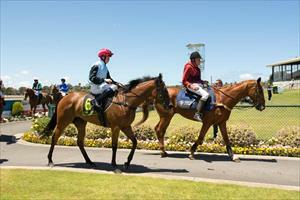 Meanwhile it is a quiet weekend for us with just the one runner - but a nice one - at Flemington on Saturday. Having just her second start having been most impressive saluting at her Warrnambool debut, Beyond Purple takes her place in the Inglis Dash with Chris Parnham to take the ride from barrier 8. "We are throwing her in the deep end a bit," Michael Moroney said, "but she is a nice filly and races with this sort of prize money don't come along off season very often." A $250,000 event, the Inglis Dash has attracted a field of 15 runners with Moroney keen to see how Beyond Purple measures up. "She is very quick around corners so the straight track is the question mark - but she has trained on very well."